Artists of the agency K und K Wien will go on tour with an innovative musical-culinary project. Viennese cooking and musical tradition are being presented at the highest level by well-known cooks as Christian Domschitz from the famous Viennese restaurant „Zum Schwarzen Kameel“ and operasingers at various places and festival centres. 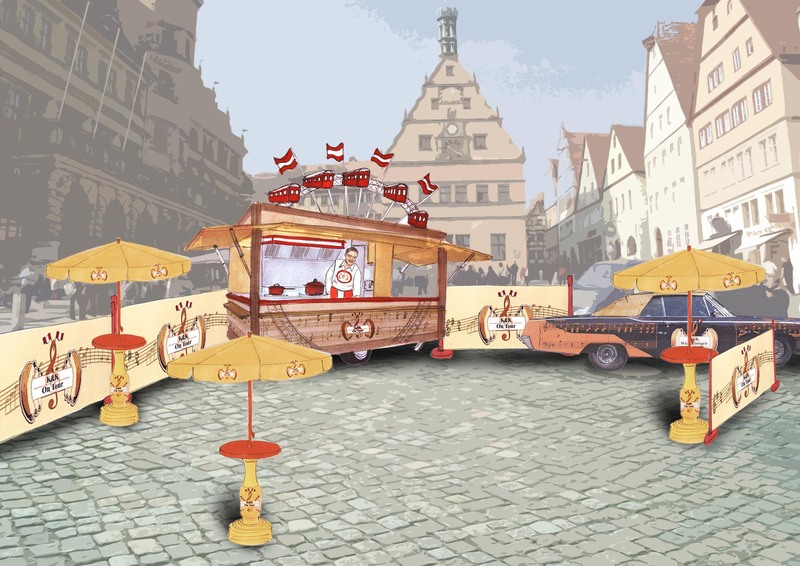 In the “K und K Mobil”, a luxury mobile sausage stand designed by the artist Claudia Raab, combining Viennese tradition with modern design as well as effectful stage esthetics with a practical concept, culinary delicacies from the Viennese traditional houses will be prepared and served to the audience during an exciting and many-sided musical program. Accompanied by the dynamic young chamber orchestra Divertimento Viennese, established opera singers present Viennese songs and popular opera arias next to sausages of the best Viennese standards. Because of its mobility, it is possible to present this project in different places, and specifically suited to festivals or other events with much activity in outdoor spaces. Enjoy a tasteful musical experience, a spectacular and entertaining happening for gourmets, opera lovers and all those, who would like to discover classical music and Viennese tradition in a completely different way.